The literal translation of the Japanese word banzai is “ten thousand years.” But the Japanese use it like the French use vive or the English “long live.” To think that the Japanese in 1934, amid crumbling relations with America, would come out by the thousands to apply that honorific to Babe Ruth and other major leaguers is a fascinating and little-known story. Banzai Babe Ruth is far more than just a sports story. It is, as Robert K. Fitts writes, a story of “sports diplomacy, espionage, infidelity, attempted murder, and an attempt to overthrow the Japanese government.” Whew. But in 1934, two men decided to give it another go. One was an enterprising Japanese newspaper owner, Matsutaro Shoriki, who thought, rightly, that sponsoring an American all-star tour would increase sales; the other, and the real hero of Fitt’s book, was major leaguer Lefty O’Doul, who had been to Japan in 1931, loved the country, and would eventually form the first Japanese pro baseball teams. Banzai Babe Ruth isn’t really so much about The Babe, although he lurks around every corner like an accident waiting to happen. It’s more about O’Doul, and the banjo-hitting catcher Moe Berg, who, it was said, “could speak twelve languages and can’t hit in any of them.” Berg was never without his camera, and may well have been an American spy. It’s also the story of Eiji Sawamura, a young pitcher who initially adored, then ultimately hated, America. No one could have told this incredible story better than Robert K. Fitts. The greatest expert on Japanese baseball in America, Fitts has written two previous books on the subject, including Remembering Japanese Baseball: An Oral History of the Game. 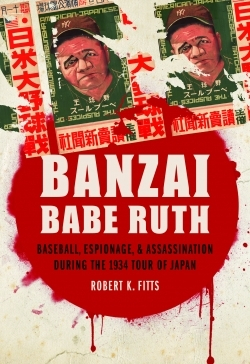 With Banzai Babe Ruth, Fitts reveals the social, historical, and cultural traditions of a country with which we shared a common interest in baseball, and little else. Some of the rare photographs, including one of Babe Ruth in the outfield, a glove in one hand and a Japanese umbrella in the other, are alone worth the price of the book. Banzai Robert K. Fitts.